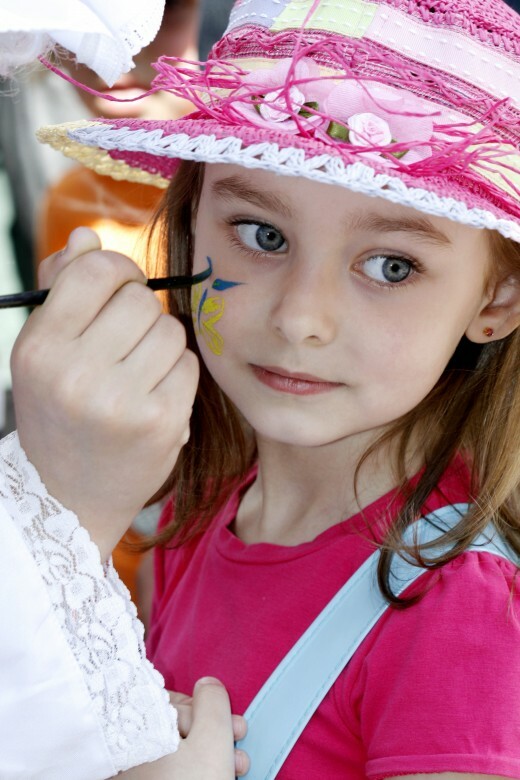 Face painting is super popular now, but it's nothing new. In fact, some archaeologists believe that Neanderthals used face painting. 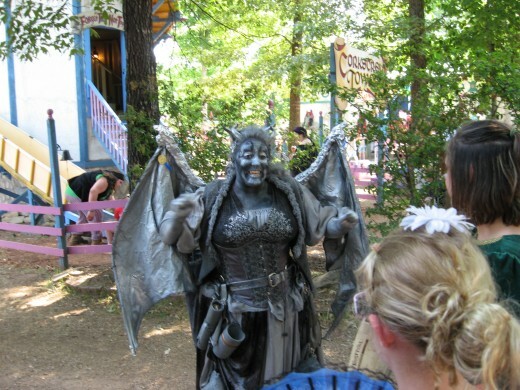 Historically, man has used body and face paints for religious ceremonies, during hunting, and during battles. Most ancient tribes and peoples painted themselves for special occasions. For instance, the ancient Celts often painted their faces and naked bodies blue before going to battle, perhaps to make themselves appear more fierce. Native Americans often used face paint that we sometimes refer to as “war paint.” The faces of hunters were often camouflaged with pigments to make them less conspicuous to their prey. 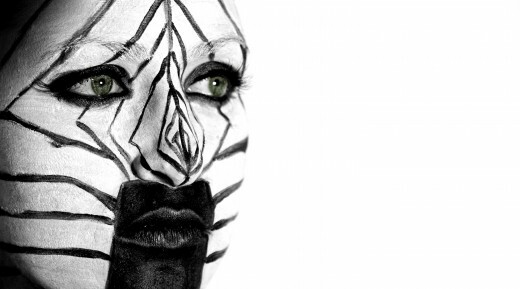 Early face paints were raw pigments found in nature. Obviously, these folks couldn’t run to a local store to buy professional face paint. They used clay, charcoal, ashes, the juice of berries, bird droppings, moss, and extracts from roots and plant stems. Some of these raw materials were dried first and then pounded into a powder to be mixed with animal fat. The paint was usually applied with the fingers or with a stick. That’s a far cry from modern face painting! Most people use the terms face painting and cheek art interchangeably, but I usually don’t. I use the term face painting for images or designs that cover most of the face, and I use the term cheek art for smaller images and designs that are made on just the cheek area. I’m sure you get what I’m saying here. You’ve undoubtedly seen lots of examples of cheek art at festivals, fairs, parades, kids’ birthday parties, and school functions. At sporting events, you often see a #1 in team colors painted on the cheeks of fans. Face painting, on the other hand (at least for me), creates a larger, sometimes much more detailed image. 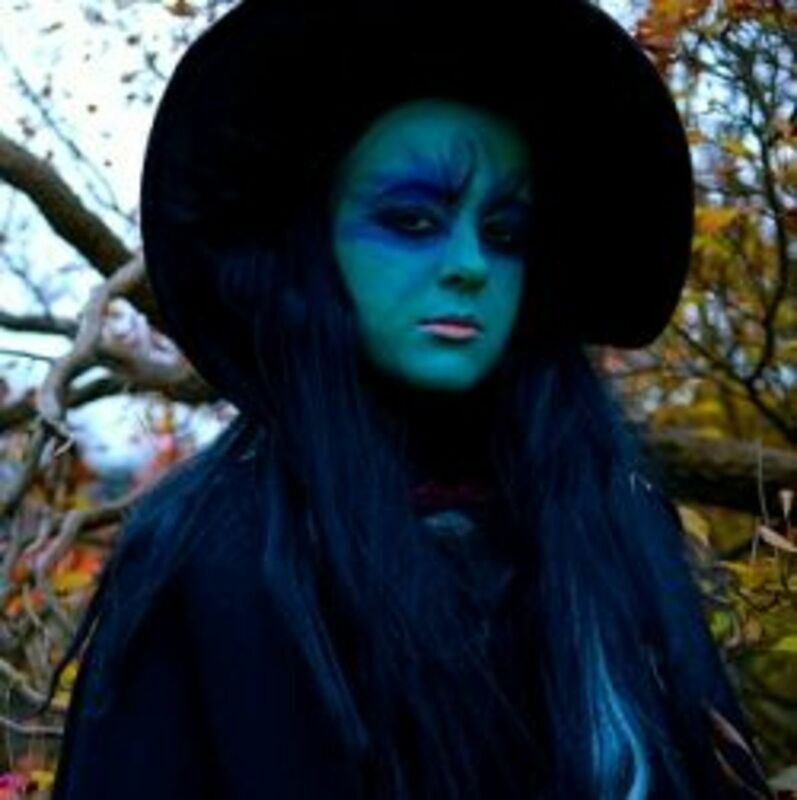 These full-face designs are often seen at Halloween, when people want to look like a cat, a dog, a leopard, a vampire, or a witch. Some of these are really amazing! Keep in mind that such detailed images will require a lot of practice on your part, along with a dose of talent. The great thing about practicing face painting at home is that you’ll be near a sink with running water, so if you “mess up,” you can wash away your mistakes and start out fresh! Another good thing is to learn from your mistakes. 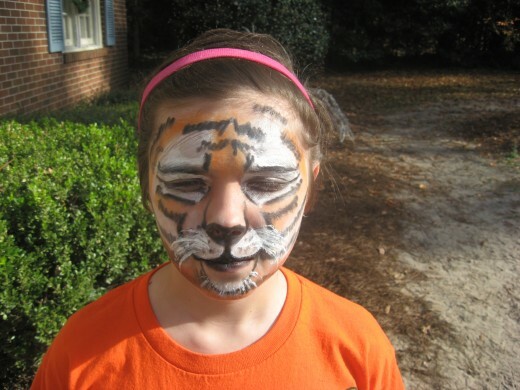 There are several different types of face paints you can use. Just be sure they’re safe for sensitive skin. It’s tempting to use acrylic markers for face painting, but don’t. Acrylics and tempera paint aren’t meant to be used on human skin. People with sensitive skin might have a reaction to acrylics, and besides, they’re hard to wash off. Of course, your best bet might be professional face paint. Most are very hypoallergenic, so the chances of a reaction are slim. 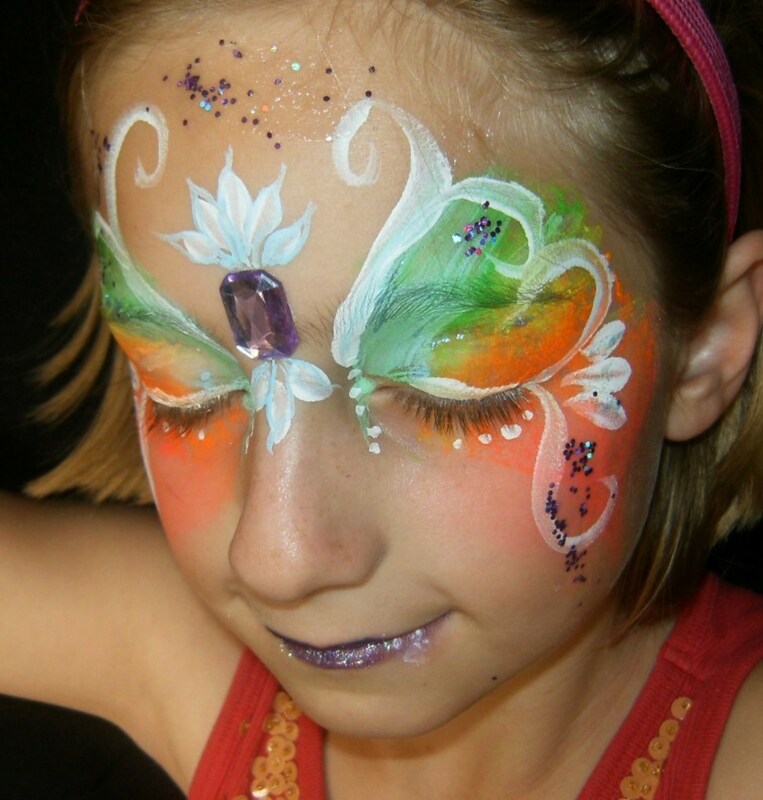 Professional face paint usually comes in cake disks and might be water based or alcohol based. You can find just about any color you can think of, so that shouldn't be a problem. 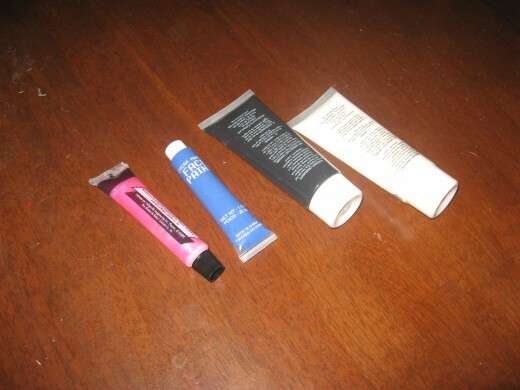 You can find face paints that come in tubes and tubs, too. I don't much care for the cheap tub versions, unless I'm using them as backgrounds, but I do like the paints that come in tubes. The consistency of the tube paints is very similar to acrylics, and I'm accustomed to working with them on canvas. You might also want to use traditional makeup. I’ve used liquid foundation, powdered foundation, lip liner pencils, powdered eye shadow, eye shadow pencils, eyebrow and eyeliner pencils, concealer sticks, bronzers, and powdered blush for some of my designs. Liquid eyeliner applied with a tiny brush is great for detailed work! Use the brush that comes with the eyeliner to create fine lines, outlines, and lettering. They’re also great for creating individual hairs on animal designs. Here’s another one of my face painting tips I’m going to share with you: Try food writing pens! I use the ones made by Wilton, called “FoodWriter.” These pens look like felt-tip markers, and they work the same way. They come in a variety of colors, too. The paint from the pens is very easy to control, and I assume it’s safe to use on skin. After all, it’s safe to eat, so it should be fine to wear. 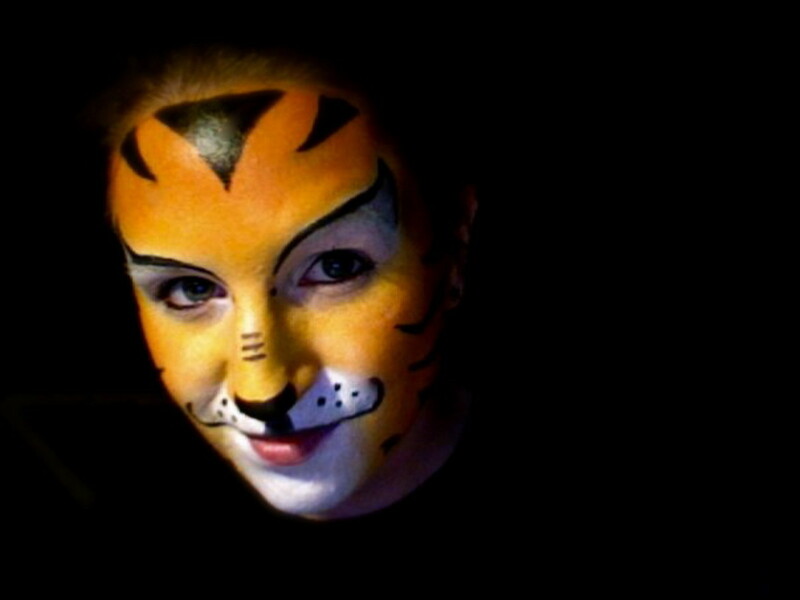 My friends, students, and co-workers have often asked me how to do face painting. It’s really not difficult, especially if you keep the designs simple. Just consider the face to be painted as your canvas or drawing pad. When you’re just starting out with face painting, it’s a good idea to practice some brush strokes on paper first. Once you learn to handle the brush, try a few easy face painting designs on your drawing paper. Remember, though, that a human face isn’t exactly like a drawing pad. The face has contours, bumps, ridges, and depressions. 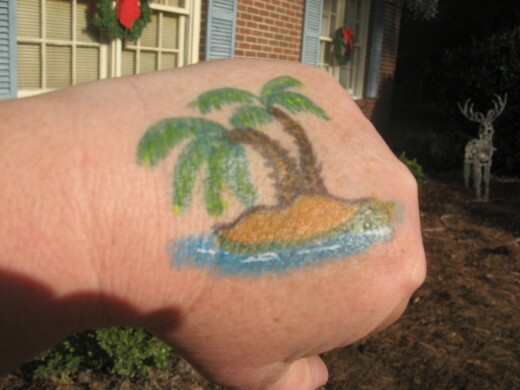 Once you've mastered painting on paper, try painting some designs on the back of your hand or on your forearm. That will give you a good "feel" for what it's like to paint on skin. After learning to hold your brush, the first thing you need to learn is how to control the face paints. If you’re using a paint pen, this will be easier, but even that will require some practice on your part. If you’re using brushes, you’ll probably need even more practice. By using the brushes with paints on paper or some other flat surface, you’ll acquire some skills and techniques that will help you make better, sharper face painting designs on people. Unless you're accustomed to using a sponge, you might want to spend a little time practicing with that, too. A makeup sponge is a great tool for covering large areas with face paint, like when you're doing a mask or a full face job. If you’re making a design that needs to be the same on both sides of the face, use the facial features as a guide. Make a rough outline first, then step back to see if the design is symmetrical. If it’s not, remove one side with a damp cloth and redraw it once the skin is dry. Start with super easy designs before you move on to more complicated projects. Even if you're talented and proficient at drawing, you’ll find that face painting is somewhat different. Many of your drawing techniques and skills you use while painting on canvas will transfer, of course, but the techniques involved are slightly different. Don’t’ worry, though – practice makes perfect! Okay, I’m not perfect, but I’m still working on it. Brushes – You’ll need several good quality artist brushes. Try different sizes and shapes. 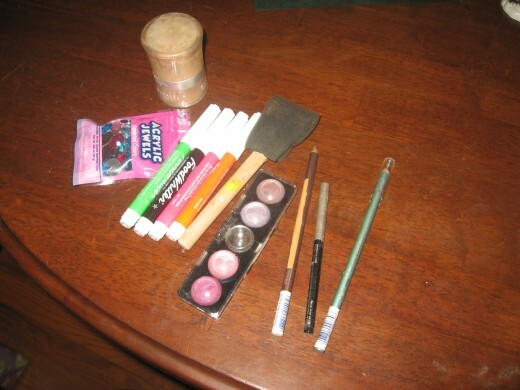 Brushes also have different “stiffnesses.” Soft brushes usually work best with face paint, but you might want to use stiffer brushes for some effects. Acrylic stones – These are acrylic “jewels.” The backs of the jewels are flat, and they come in a wide selection of colors, shapes, and sizes. You can find them at Walmart. Cake paint – Paint that comes in a round “cake.” This is basically a shallow disk of paint. Cheek Art – Designs and images that are painted onto the cheek area. Drag – To pull paint with a brush or other implement. Full face – A Design or image that covers most or all of the face. Glitter gel – A paint gel that contains glitter. Glitter gel is usually applied on top of paint. Loading – Adding paint to a brush or sponge. Mask – A design or image that covers approximately the top half of the face. Shading – A subtle blending of light and dark shades that simulate shadows and depth. Sponge – A small cosmetic sponge, like one you’d use to apply liquid foundation. Stones – Rhinestones. The stones might be made of crystal, as in Swarovski stones, which are fairly expensive. Acrylic stones are much cheaper. 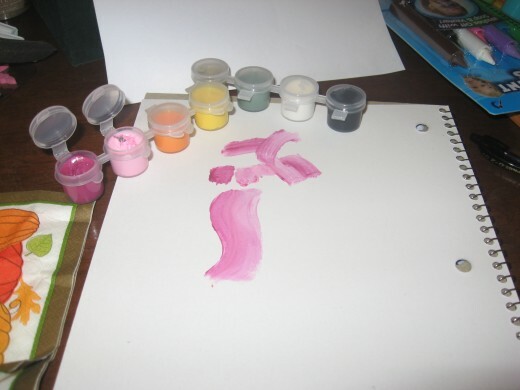 Twirling – Turning the brush in your hand as you’re applying paint. I have a few face painting tips for you, based on my own experience. One of the most important is to start with a clean, dry face. Ideally, the face should be scrubbed with an exfoliate and thoroughly rinsed and dried. Obviously, this isn’t possible if you’re doing face painting at an event. If I’m doing a full-face design on an adult, I like them to exfoliate before the painting begins. Dead skin isn’t usually a problem with kids, though, so I just make sure children’s faces are squeaky clean and completely dry. Make sure the paint you’ll be using is safe for faces. If the person has super sensitive skin, you might want to apply a little of the paint on the person’s arm or hand first to see if there’s a negative reaction. I like to use water-based paints, and I thin them with water. Be careful not to get the paints too thin, however. 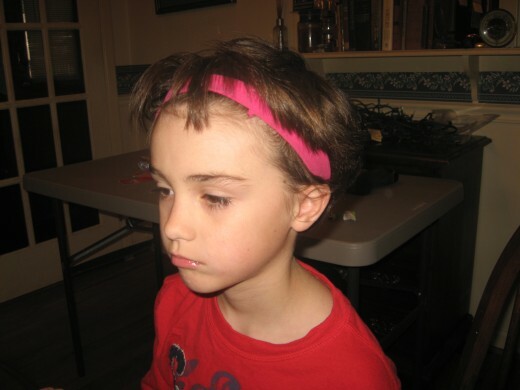 If you’re doing face painting at an event, bring along some hair bands, bobby pins, and hair clips. You’ll need to keep the paintee’s hair away from the face. When the paint is completely dry, you can set the hair free. You'll also need plenty of clean water, some cups, and lots of paper towels. I've found that baby wipes are good for correcting mistakes and removing paint. Once you have your design in mind, it’s usually best to start with the lightest colors or shades first. For large areas, use a damp – not wet – sponge to apply the paint. Do so by “daubing” – not by smearing. You might need more than a single coat. If you do, allow the first coat to dry before adding another. A blow dryer serves this purpose well. If you want to add glitter, make sure it’s safe for faces, and don’t use it near the eye area. A tiny fleck of glitter in an eye can be pretty painful. If I’m using glitter, I always add it last. By the way, you can find face paint gels that already contain glitter, so you might want to use those. For 3-D-like designs, you’ll need to learn to use shading. The parts that you want to appear farthest away should be the darkest, and the parts that you want to appear closest should be the lightest. In between these two focal points should be some intermediate shades. All the shades will need to be blended together for best effect. To achieve a soft blending of shades, like at the edge of the outline, you can double or triple load your brush. For example, you might want the wings of a butterfly to be a mixture of purple, mauve, and pink. If so, you can use all three colors at the same time, on the same brush. The darkest shade should be on the outside, and the lightest shade should be on the inside. At least, that’s what has worked best for me. Practice, practice, practice controlling your paint and brushes! I know – I’ve already mentioned this, but it’s extremely important. With practice, you can learn to create special effects and really add detail to your designs. Here’s an easy one that you’ll need to master: Lift your brush to make sharp points, so that just a few of the brush hairs are in contact with the face. To make straight or curved lines, like you'd want for whiskers, try this trick. Dip the edge of a strip of paper in white paint, and wipe off the access. Barely touch the painted paper to the face. Reload paper with paint between each whisker. There’s no way I can list all the face painting designs I’ve used and seen! Really – the choices are endless. If you can imagine it, it can be applied to a face or cheek. Oftentimes, when you’re painting at an event, people will have their own ideas of what they want, so you might not actually have to come up with a lot of ideas for face painting designs on your own. If someone asks you to make a design you don’t feel comfortable or adequate with, tell the person so. 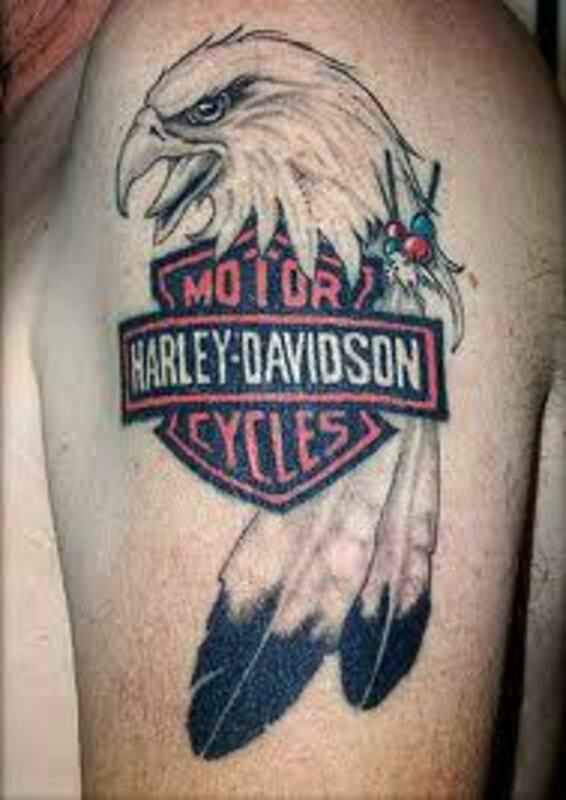 Suggest another design or two, instead. 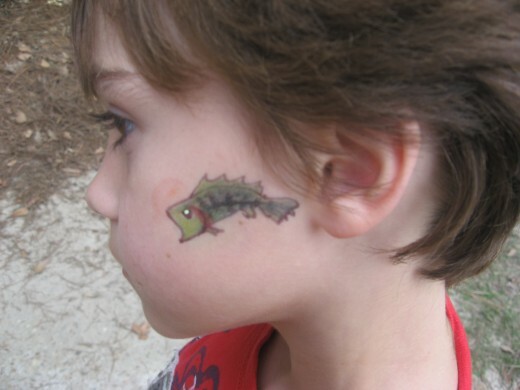 No one wants to be stuck walking around at a fair all day with a crappy example of cheek art on their face. That wouldn’t be very good advertising for your business, either. It’s usually best to stick with what you know how to do well. A well made simple image or design is much better than a substandard design that’s more complicated. If you practice enough at home, you should have a pretty good repertoire of designs in your arsenal. I’m lucky in this respect. I have nine grandchildren, and they’re always ready to allow me to practice my skills on them! 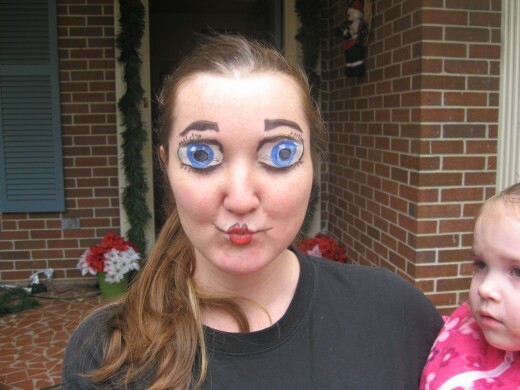 If you don’t have any willing guinea pigs, you might try painting your own face. I’ve done this a time or two, but I find that it’s easier for me to paint someone else’s face than it is for me to paint my own. There’s a lot of easy face painting you can do, even if you can’t draw a lick! 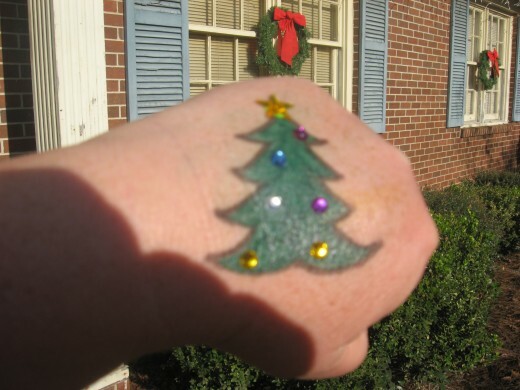 You can use face painting stencils and stamps for outlines, and you can even use your own body parts – or the body parts of the “paintee.” A thumbprint can easily become a quick balloon, for example. 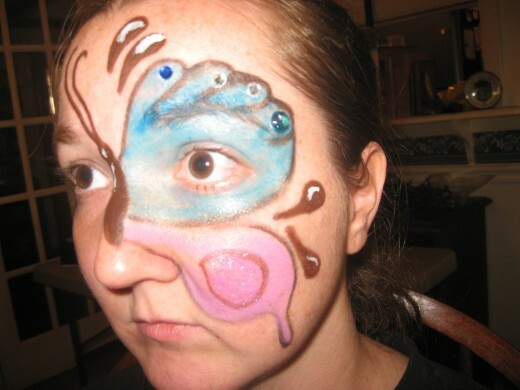 Another easy face painting example is a butterfly, which is also extremely popular, especially for females. 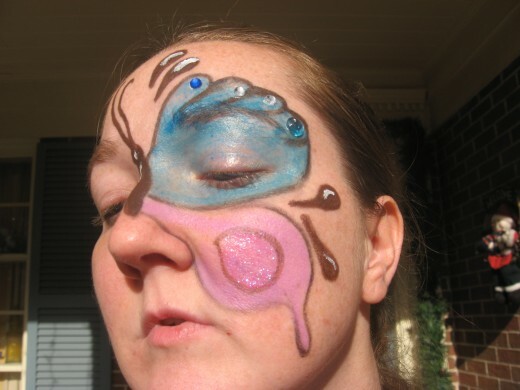 Okay, so you might not think that drawing a butterfly on someone’s face is easy. Even if you can draw a basic butterfly, getting both sides to be symmetrical might seem tough, right? 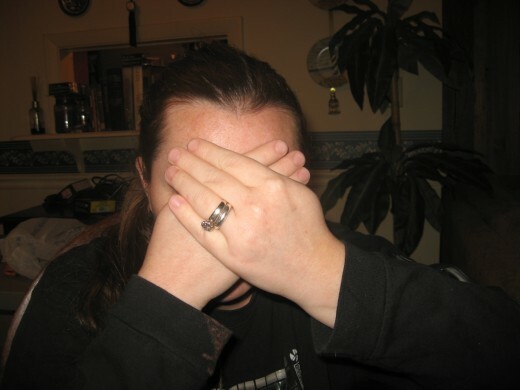 Here’s an easy way to get a good basic design that will provide symmetry: have the “paintee” fold her hands over her face, with her palms resting on her nose. You’ll have a good outline for the placement of the top pair of wings. The nose will serve as the butterfly’s body. If you look at the face painting pictures below, you’ll see what I mean. You can also trace things you find lying around the house. Think outside the box! For instance, if you need a circle, trace the bottom of a glass onto the face that’s to be painted. For areas that need to be straight, use a ruler. Use the corner of the ruler for sharp angles. When I’m tracing a shape, I usually draw the outline with a food writer in the same color that the design will be painted. The outline then blends in seamlessly, and if I want a sharper, more pronounced outline, I can go back with a darker pen or a black eyeliner around the edge of the motif. 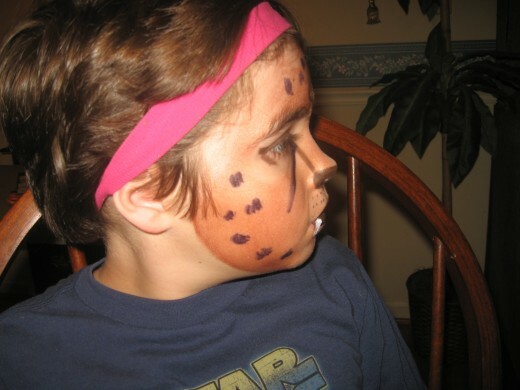 If you’re not artistically gifted, you might want to try using face painting stencils. Actually, practically any type of stencils will work, but you have to learn to control the paint you’re using. I strongly suggest practicing with your stencils on paper first. 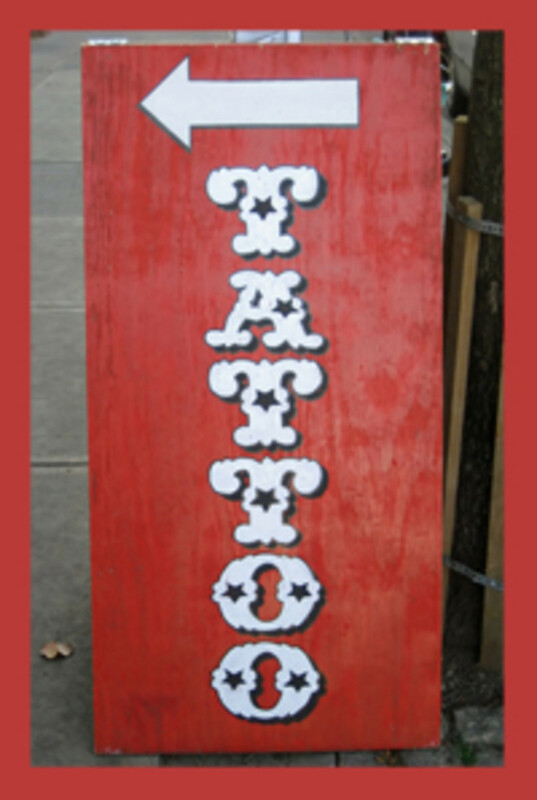 Don’t “paint” the stenciled design. Instead, blot the paint on, using only a small amount of face paint at the time. Your brush should contain only a small amount of paint, and the paint shouldn’t be too thin. Be careful around the edges. If you’re not, paint can “bleed” under the edges or it can “cake up” there, possibly ruining your design or image. Try to hold the stencil as close to the skin as possible while you’re dabbing on the paint. You might need to apply several thin layers of the paint, by the way. 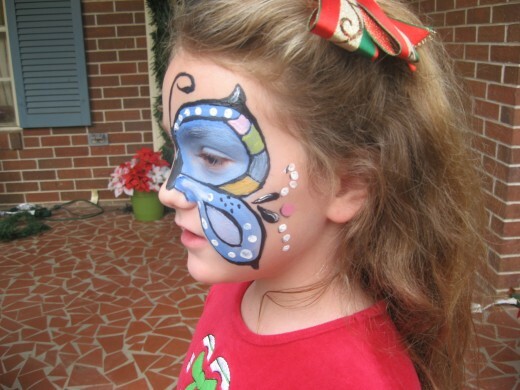 You can make your own stencils for face painting, too. This can make your work a lot faster and more appealing. One I’ve used several times is a stencil I made for Spider Man’s eyes. I cut the design out of a folder, and I use the same stencil for both eyes. After painting one eye, I just turn the stencil over and use it for the other eye. Of course, I wipe off any excess paint in between painting the two eyes. 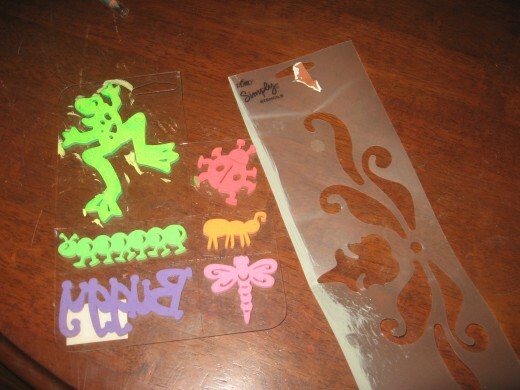 In addition to face painting stencils, you might want to try using stamps. I’ve done this before in order to get a sharp outline for designs. I apply some paint, usually from a paint pen, to just the outer edges of a stamp before applying the stamp to the skin. 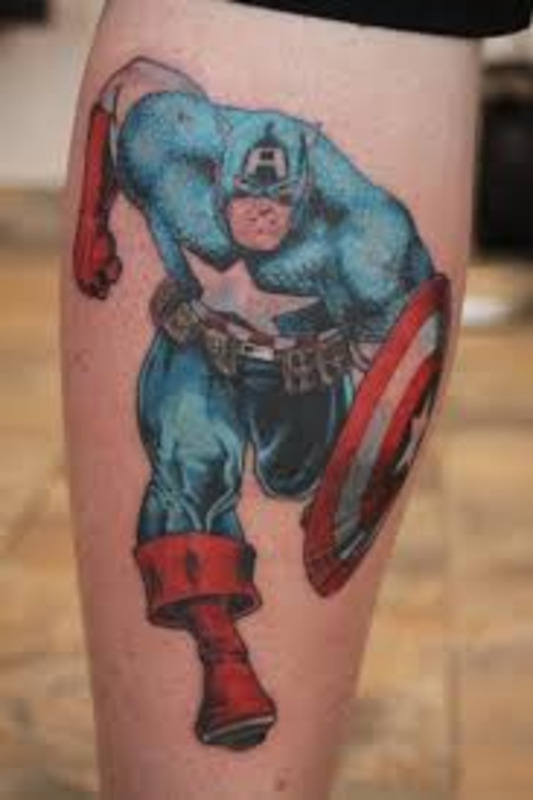 I then fill in the design, and I usually make a sharp outline with a fine brush or face paint pen. 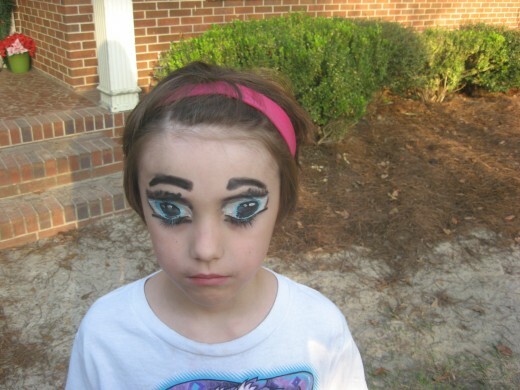 Or, as I’ve already mentioned, I sometimes use liquid eyeliner. Looking for some face painting ideas? You can find lots on the internet, so I’m probably not showing you anything new here. But just in case…animal faces are always popular. Some of the most requested are for dogs, cats, tigers, leopards, and cheetahs. You can cover the entire face, or you can do a partial face paint that includes making the ears at the eyebrow area. 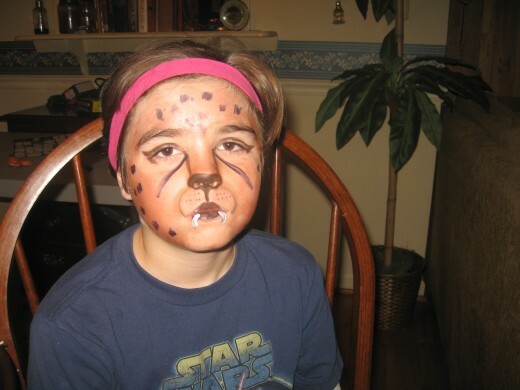 You can do realistic animal faces or funky designs like rainbow tigers, hot pink and black-striped kitty cats, or leopards with purple spots. Super heroes are popular with boys, and Spider Man seems to be the one most requested. 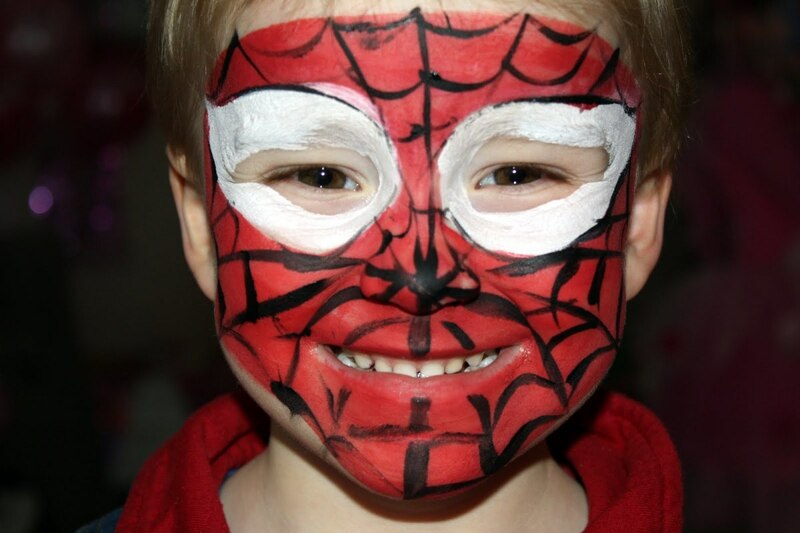 You can make a full face Spider Man, a small Spider Man cheek art, or a Spider Man that includes only the top portion of the face. Many teenagers like for their faces to resemble anime characters, and these are fairly easy to achieve. The most important element here is to make the huge anime eyes over the paintee’s eyes. Teenage boys seem to love skulls, and these are fun to make, but they’re challenging and require a lot of shading and detail. Girls of all ages seem to like butterflies, whether it’s a small cheek art design, a full face design, or a partial face design. 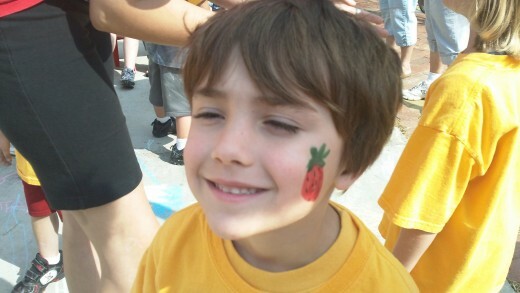 Some other face painting ideas for cheek art include ladybugs, dragonflies, geckos, snakes, dragons, palm trees, stars, hearts, lips, apples, beer mugs with foam, birds, frogs, fish, dolphins, bumblebees, flowers, skull and crossbones, margaritas, guitars, unicorns, horses, zebras, swords, daggers, and deer heads. I’ve had pageant girls ask for crowns, and I once had a bass angler ask for a largemouth bass to be painted on his cheek. 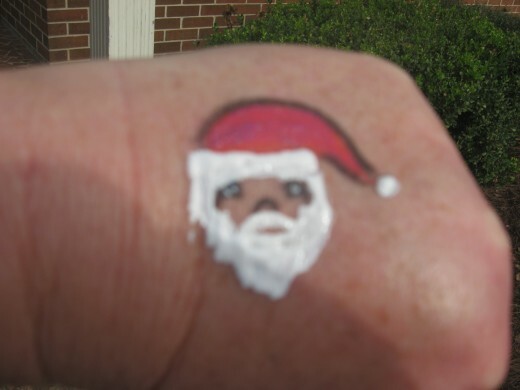 Some of my face painting ideas have come from my grandchildren’s requests. 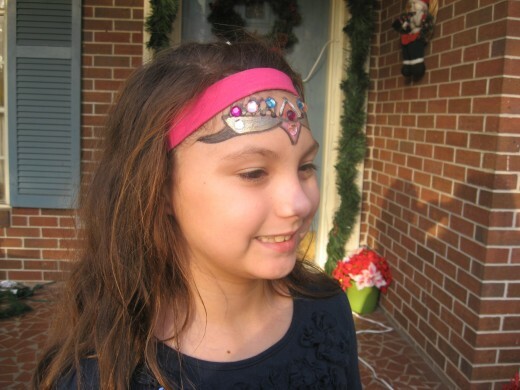 For example, my granddaughters are little divas who love “bling bling.” They like for me to add Swarovski or acrylic rhinestones to some of their designs. I’ve found that small stones are light enough to adhere to face paints. Just add a little extra paint to the spot where you want to add a stone, and place the stone while the paint is still tacky but not completely wet. If you don't get a secure hold, try using spirit gum to fix the stones to the face. Make sure you have some spirit gum remover on hand, though. 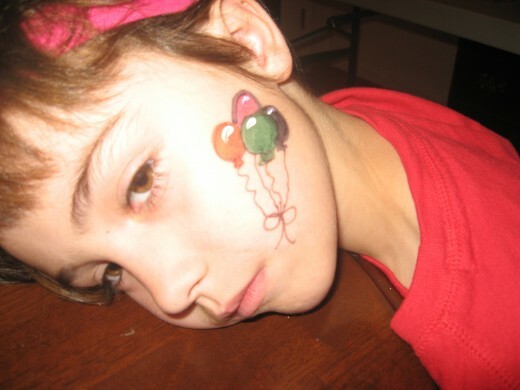 These face painting pictures include examples of my own work. I just recently began this craft again, and I discovered that I'm a little rusty. It's gradually coming back to me, but my hands and wrists don't work as well as they did before I had nerve damage. 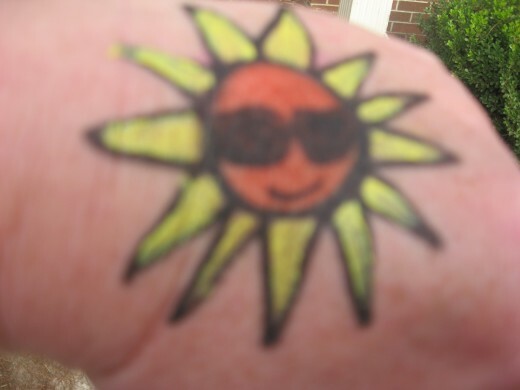 Sorry, but I had to do some of these on my hand and arm, as there were no willing participants around when I had the urge to paint. If you’re just getting started with the craft, the following photos might provide you with some face painting ideas. You have some amazing artwork here! Great ideas - and I love the tip on using the food pens to do face painting! Thanks, Holle, for the tip about the Food Writer pens for face painting. Makes a lot of sense to me. Great photos and easy to understand tips.